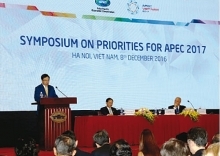 (VEN) - The first event of Asia Pacific Economic Cooperation (APEC) 2017 set the tone and directions for the year-long series of events being hosted by Vietnam for the 21-member forum. The first APEC Senior Officials Meeting (SOM 1) that took place in February in the city of Nha Trang focused on two policy goals: developing support and service industries. The Ministry of Industry and Trade (MoIT) coordinated with the Japanese Ministry of Economy, Trade and Industry to organize a seminar focusing on APEC support industries policy. The seminar was aimed at discussing how APEC economies can develop support industries, thus facilitating regional trade and investment and promoting the participation of micro, small and medium enterprises (MSMEs) in global value chains (GVCs); creating opportunities to connect policy makers, managers and other parties in order to build competitive and modern support industries; and contributing to the creation of policy guidelines and best practices for support industry development, covering areas such as research and development and human resource development. All APEC member economies consider support industries a strategic development priority. Sustainable development of support industries will yield socioeconomic benefits, creating jobs, promoting technology transfer, consolidating the internal strength of economies in the fierce competition for foreign investment, and creating opportunities for developing economies to participate in global production and supply chains. 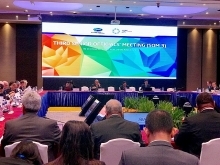 Seminar participants agreed on APEC’s plan to promote support industries in two stages. In the first stage, the APEC Policy Support Unit (PSU) has already conducted studies on the support industries of three APEC member economies: Australia, Mexico and Vietnam, in order to analyze their policies and learn from their experiences in enhancing competitiveness and modernizing support industries. In the second stage, Vietnam will coordinate with Japan and the PSU to create policy guidelines and best practices for support industry development, which will be submitted to the 29th APEC Foreign and Economic Ministers Meeting scheduled to take place in November in the city of Da Nang. As part of SOM 1, the MoIT, in association with the APEC Secretariat, organized a public-private dialogue on services for policy makers, businesses and experts to discuss further regional cooperation in distribution, transportation and logistics. Seminar participants agreed that services play an increasingly important role in international trade and significantly contribute to the economic growth of a country, as well as a region. According to Luong Hoang Thai, Director of the Multilateral Trade Policy Department, the potential of regional cooperation in service development remains untapped. Therefore, to achieve the over-6.8-percent service growth target set for 2025, APEC member economies should tighten coordination in implementing the regional roadmap for service development in each specific area. The MoIT was instrumental in organizing the sessions and enhancing their content, sending down officials from its various departments to contribute information and views on fields such as economics, trade, industry, public-private partnership and chemical industries. In addition to the broader goals of APEC’s development, the MoIT hopes its contributions and policy initiatives will help increase the presence of the Vietnamese business community, especially small and medium-sized enterprises, in the regional and global markets.